A German composer and conductor born January 29, 1971. 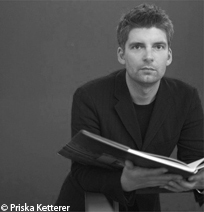 After instrumental training (piano, violin, percussion), Matthias Pintscher studied conducting with Peter Eötvös as well as composition with Giselher Klebe in Detmold and Manfred Trojahn in Düsseldorf. He also met Hans Werner Henze during the summer classes at Montepulciano. With his first opera, Thomas Chatterton (1998) he achieved international recognition. He was invited all over the world and in 2008 Pierre Boulez conducted the premiere of his Osiris with the Chicago Symphony Orchestra. Literature and the other arts hold a special place in his output: the poems of Edward Estlin Cummings form the basis of Twilight's song (1997) and Lieder und Schneebilder (2000); his opera L'espace dernier (2004) was based on texts by Arthur Rimbaud; the five parts of his cycle Figura for string quartet and accordion (1997-2000) are the result of a study of the sculptures of Giacometti. Fascinated by the world of sound, Matthias Pintscher deploys sound landscapes and fills his works with detailed instructions. In parallel he teaches composition, notably at the Hochschule für Musik und Theater in Munich (2007-2009) and at New York University, though above all, he performs a vast repertory with the orchestras he conducts, in particular the New York Philharmonic, the Orchestra of Cleveland and the BBC Scottish Symphony Orchestra. In 2013 he assumed the musical direction of the Ensemble Intercontemporain. Les partitions de Matthias Pintscher sont éditées par Bärenreiter.